Do you want to learn the creative aspects of producing digital content with artistry and expertise? 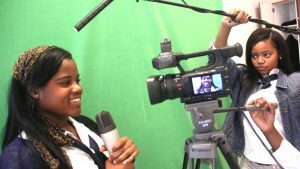 Digital Media Production (Multimedia) is a dynamic, instructional program that focuses on the creative aspects of designing print, video, photographic, web-based and interactive audiovisual materials. Our program teaches students to bring a design problem to a logical solution, and to communicate feelings and emotions through printed materials, photographs and videos. Students concentrate on developing an understanding of the fundamentals of digital design, photography and video production. Through internships, events and design competitions, students have the opportunity to apply design principles to a variety of communications projects. Digital Media Production courses include audio and visual design concepts, videography, color theory, typography, advertising, website design, photography and digital animation. Students in this program can obtain Adobe Certified Associate Certification in Illustrator, inDesign , Premiere and Photoshop.